BBQ chicken that has been cooked perfectly will taste delicious. Although it seems that with its increased popularity and careless manner of BBQ cooking, many people cannot enjoy this. When the chicken has been barbecued improperly, it looks still pinkish in the center and burnt on the outside. Not only it will affect the taste but it also becomes unhealthy. Here is a guide to BBQ chicken in a good way it can be enjoyed. First, select the type of chicken which has to be barbecued. Legs and thighs are preferred by some while others like skinless and boneless chicken breasts. If barbecuing more than one chicken part is desired, then the cooking times would have to be adjusted. 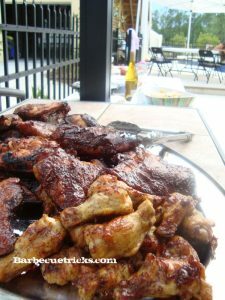 White meat like breasts and wings cook faster than dark meat like legs and thighs. Now, pick the grill which is desired to be used. This will rely on how one wants to cook the barbecue. This will also depend on the neighborhood one is living in plus the lifestyle. If a person is a beginner at grilling, then the gas type is recommended. However, this might not be easy to use during the holidays. The chicken has to be marinated. This process will allow the flavor to sink in to the chicken making it taste great after it is grilled. A marinate flavor can be selected as preferred. There are variations available from lemon pepper to teriyaki. If the chicken is marinated in the fridge, it has to be made sure that it is not left in there for more than 48 hours. At room temperature, it has to be leaving it for an hour. When the chicken has been marinated, it can be now rubbed with the seasonings. This will depend on the type of flavor which is needed to be given to the BBQ chicken. The chicken has to be pre-cooked by pre-baking. The ideal temperature for baking it is 360 degrees in the oven until partially cooked. This will seal in flavors and will ensure that the chicken has been cooked before it goes to the grill. Others do boiling. However, boiling takes away the flavor and makes it taste weak. Now the grill has to be made ready while the chicken is baking. If a charcoal grill is being used, ignite the coals and they should be left to burn until a white coating of ash appears on the coals. In case of gas grill, it has to be preheated to a medium heat temperature of 360 degrees. The grate also has to be sprayed. Put the seasoned chicken on the rack and cover it with the grill lid. It should be given at least half an hour to cook. With time, it has to be checked and turned after every five minutes for ensuring that it is evenly cooked. The pieces can also be rotated to balance the cool and hot spots on the grill. The BBQ has to be glazed again with the seasoning nearly 10 minutes before taking chicken off the grill. After grilling, the chicken pieces can be checked with a meat thermometer. The bone should be never touched when the thermometer is inserted. The internal temperature of the meat must be 175 degrees. Finally, the BBQ chicken is ready. It can be served with delicious side dishes like coleslaw, pasta salad, potato salads, baked beans and biscuits. Preparing BBQ chicken is not a boring work, it is fun and these easy steps will help to make a perfectly barbecued chicken that everyone will love! You might also be interested in learning how to can fruits and vegetables and how to BBQ chicken. Chopped Or Pulled Pork? Chipotle to add a kick? Rack Your Ribs with this space saving bbq gadget. From BBQ Podcast site GrateTV This is the second episode of our BBQ show recently renamed GrateTV (previously MeatheadsTV). Viewers question the benefits of chopped vs.pulled pork for competition and the backyard. Plus we look at a solid Rib Rack and a secret ingredient that can fire you up. Hosted by Jack Waiboer from Carolina Pitmasters and our very own Bill West. Consider a Mortar and Pestle as a gift for Dad. Barbecue weekly podcast from http://GrateTV.com featuring a grilling gadget, viewer mail, and a secret ingredient revealed. The magic of mustard and the popular website the Smoke Ring discussed. Plus, is “the stall” real? Jack Waiboer and Bill West mull it all over in the first episode from GrateTV. Moms and Dads are different. Mom’s version of pampering may be a trip to the spa, candy or flowers… but Dad wants something a little more primal. If you’re considering gift giving for Dad for a birthday, Father’s Day, or Christmas think about his appetite! Think BEEF! These days the premium mail order food business is booming. Why? Because people like the quality and convenience. Omaha Steaks is a family business that has been based in Omaha, Nebraska since 1917. 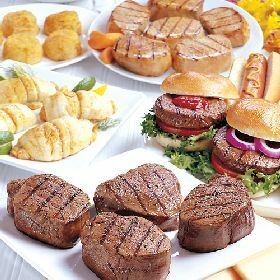 Others companies like Allen Brothers Steaks have become solid competitors but Omaha Steaks is the name most know. The brand is held in high regard. We unboxed Allen Brothers here. Grilling gifts are always fun for Fathers and fresh steaks (delivered flash frozen) are almost always cherished as something unique and delicious. Another advantage to ordering a gift from Omaha Steaks is the wide variety of food items you can select. From Crab Legs to bratwurst… even pet food… they have a bit of everything. 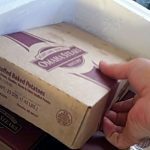 When BarbrcueTricks.com received our Dad’s day gift from Omaha Steaks we took time to do a formal unboxing and found that the company knows how to pack and preserve a box. Everything was delivered frozen solid (thanks to a generous block of dry ice and a solidly constructed Styrofoam cooler. It’s simply fun to get. 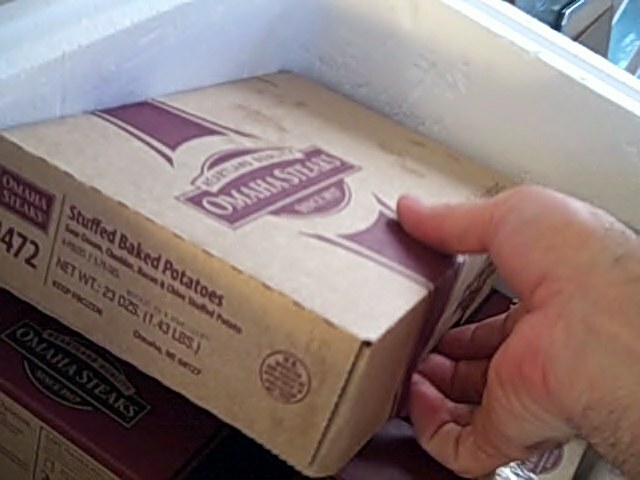 The steaks and accompaniments (we received stuffed baked potatoes) were elegantly packaged in high quality boxes and strong shrink wrap. Most important they tasted great too. You can often take advantage of deep discounts for gift and variety packages – CHECK HERE – for the steals. Barbecuetricks.com is a sales affiliate of Omaha Steaks but we also love the product. Some gift givers make sure there’s enough so Dad can cook for the entire family. What happens when good barbecue goes bad? It’s one of the topics covered during this week’s BBQ video Podcast. Plus there’s a secret ingredient that’s used in most red barbeque sauces and it’s manufacturer is changing the recipe! Find out what it is as well as an enlightening gadget for the grill. This is episode 8 of the weekly video podcast formerly known as MeatheadsTV. Jack Waiboer and Bill West talk barbecue and unveil a weekly secret ingredient.